How many of us loathe the fact that any black item of clothing loses its dark luster after what seems like just a few washes? The washing machine is already tough on premium denim fibers, especially raw denim, stripping it of its ability to flawlessly fade and break in on its own to that perfect vintage appearance and feel (I figured that one out the hard way, with my first pair of designer jeans, a raw pair of the True Religion Billy. Oops). Wouldn’t it be nice if there was some magic washing machine out there just for our favorite jeans? I know some people have found a few of their own special ways to take care of the job, apart from hand washing every few months. Buying any kind of expensive item should, in theory, mean that you are willing to spend the time and money to take care of it, but we all want to look great and have nice things, and so many of us are so short on time! I wear my black jeans so infrequently because I don’t want to deal with washing them and having them fade, so I was fairly impressed when my current favorite brand Level 99 (tied with AG Jeans) came up with “Forever Black,” which is a color-lock technology currently applied to their Liza skinny jean, allowing up to 20 fade-free washes. Remember their Forever White technology, for stainless white jeans? Yeah, I love this brand…Innovation is so necessary for survival in this tough (and currently struggling) denim market. Level 99‘s anti-fade technology is complimented by the usual luxurious stretch and shape retention in every garment, as well as the insane contouring and slimming effect and super soft feel (thanks to modal/Tencel fibers) which is another few reasons why they are so awesome in my book. Most of their jeans are in the premium price range of course, around $120 (which is lower than a lot out there), but the Liza Mid Rise Skinny in Abyss with this Forever Black technology is just $98. Believe me, you’ll feel it. However, if you’d rather not shell out that much for a pair of jeans, I also read on Real Simple‘s blog that Catherine Ryu, creative director of premium brand Citizens of Humanity, claims that all you need to do is wash your jeans inside out in cold water, with two tablespoons of salt in order to keep your blacks from fading. I’m still wary but…I guess it’s worth a try, right? I was also excited to stumble across DSTLD and discover that they are doing the same thing! Their Mid Rise Second Skinny Legging incorporates a Forever Black Modal® fabric featuring Austrian beech wood fibers, at 50% polyester, 46% modal, and 4% spandex. This eco-friendly 8.5oz modal twill fabric not only has a super-soft feel, 80% stretch and 95% recovery ability, but also a color lock technology that keeps the rich black from rubbing off on other surfaces or fading in the sun or the wash. I am in touch with this brand and am looking to do a review with these, so stay tuned! Grab a pair of the Liza Mid Rise Skinny Jeans in Abyss right here. Shop the DSTLD Mid Rise Second Skinny Legging with Forever Black® Modal here. 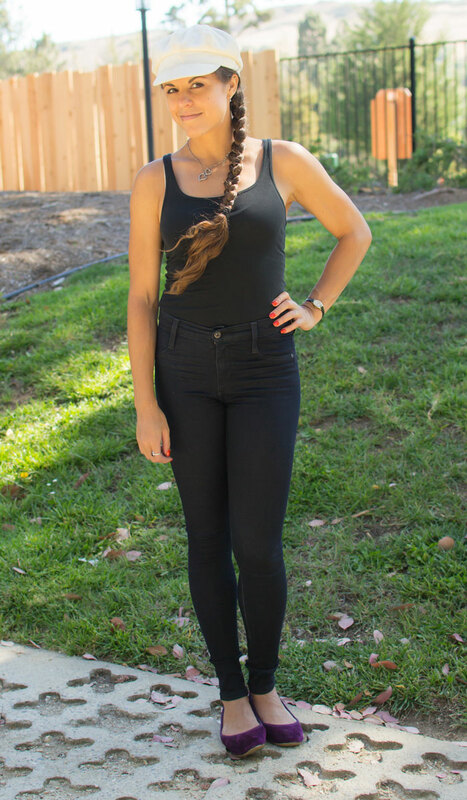 I thought I’d share a little more about my own person style on these basic informative posts…a good black skinny jean is a closet staple! Here are some tops that I would definitely pair with them. My personal fashion sense is pretty basic…I like minimal patterns and prints (at the most, color blocking), and if I wear anything of texture or anything I always balance it out with something that isn’t. I guess, come to think of it, seeing as how I have fallen for printed jeans lately, I prefer detail on the bottom more than I do up top. Apart from jeans, shoes are one of those things most of us girls like have go all out and have fun with…and I know I do when I submit myself to my second life in the nightlife scene, whether I’m DJing or catching a show. I rarely wear statement items during the day. I’m always browsing around online for more edgy pieces I can rock behind the turntables (since that kind of is the only times I really go out anymore, come to think of it…ugh now I feel old), and recently ran into Iron Fist. They take bold to the next level here…using prints both familiar and unfamiliar in pop culture, playing off sailor, tattoo, zombie, and even fairy princess themes like it’s a completely normal thing to see someone sporting on the street. I mean, “normal” is subjective…but I couldn’t believe how many frikken shoes this brand has out there for us to drool over. I know Iron Fist Clothing has been around for awhile, but I never really stopped to check any of these items out because well, it’s not really my style (but those unicorn shoes? I think I need those in my life). It nagged at me long enough to finally write a blog post, because…well, this stuff is kind of fun and like any bold fashion style, it’s got its time and place. I don’t think I could describe this brand better than they can, so I’ll just leave their bio here as stated on their website: “IF LADIES is the Loud, eye-liner obsessed crazy unicorn that hangs out in front of your local convenience store. You don’t want to look, but you can’t stop staring and wondering: Where did it come from, and why am I strangely attracted to it? We’re a mythical beast that’s a mix of reckless love, attention whoring, and adventure hunting, created by necessity from the designers who birthed it from their creative brain-loins. Our fashion’s the stuff of dreams and nightmares, giving that insolent kick to fashion to move it forward. IF LADIES – is fun, loud and never says, “Sorry.” It’s not in our vocabulary.” Yup! What they said. My favorite thing about the warm summer months isn’t limited to just music festivals, lying on the beach with a beer, and longer days that allow me to go for a theraputic jog after work…those warm summer nights are just divine! Going out on the town and hitting up the clubs is one thing I love to do, but sometimes it is just as much fun to enjoy that evening warmth at home. Unfortunately I live in a condo without a backyard, but we do have a tiny porch, and I’m always thinking of non-obnoxious ways to light it up and make it seem inviting for some evening outdoor reading or just as lounging space (that is, when it’s not taken up by a tomato bush that’s larger than me). Either way, I dream of one day owning a home with a large, spacious green lawn (assuming by then our precious California will be lush again…assuming I’ll still be in California by then as well) to host evening dinner parties, BBQs, or anything else that the summer months might bring to the home and add to my future nostalgic memories. Luxury home decor sample sale retailer One King Lane is one of those places I love to check every now and then for some fun additions to the home, ever since I helped them build up their beginnings at my last place of employment (an e-commerce company)! I’m so happy to see them still doing so well and growing so much every year. To kick off our upcoming Labor Day (and the exciting slew of sales that are to come), One Kings Lane is launching a pre-Labor Day sale this morning with these beautiful lights to live out the rest of your summer days at home to the max. 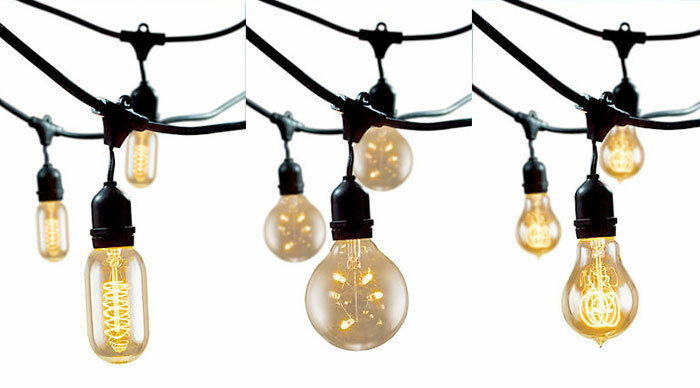 I could see these dazzling the guests of those lucky enough to live in states with fireflies (I have yet to see one) on a warm summer evening, dressing up a beach house at sunset or even lighting up a winter cabin in the California Sierras this winter. 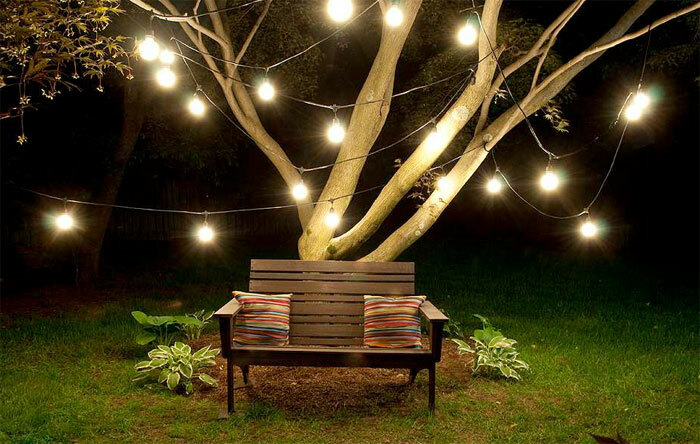 These lights have so much potential…I wonder if they’d look just as good indoors? Maybe I’ll have to grab some for myself and see. 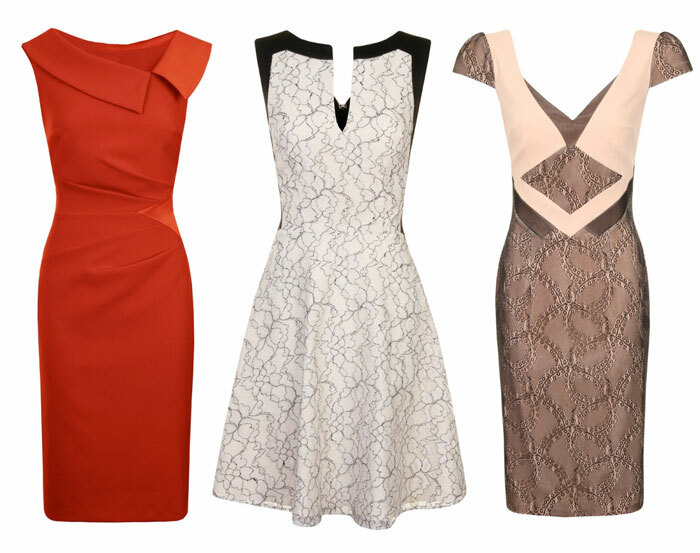 Check out three of the styles available below! Shop the sale now here! Do I really need to say much here? I can’t even remember how I ran across this awesome Etsy shop, but I am certainly glad I did. How cool is this? If you’ve seen my blog for the last few months you know how much I love the individual artisans, and I love to support them! 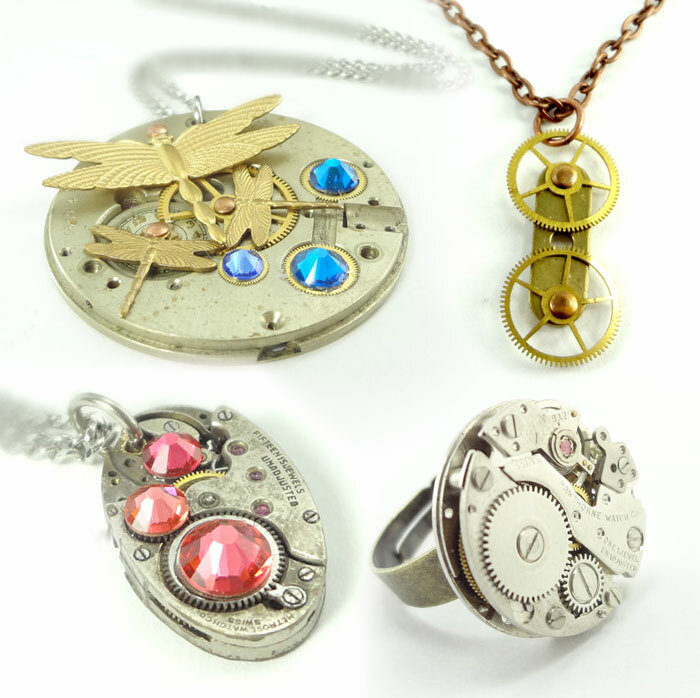 I think by now we are fairly familiar with the concept of “steampunk,” right? That is, a sub-genre of science fiction that involves 19th century or wild western steam-powered machinery. This historical fascination seems to kind of have a cult following, translating into clothing, conventions, movies…you name it, and I have no idea if it’s just popped up within the last few years or if it’s been an ongoing trend way before I became aware of it! Either way, I personally adore old fashion advertisements of all the crazy whimsical innovations that were cranked out in rapid succession (often without much thought towards them it seems) in order to fix all of the banes of everyday living. I find it both fascinating and comical and as someone in the print/design industry, I can’t help myself. Every time I wear distressed jeans or jeans detailed with paint or bleach splatter marks, I always get the same old “hey, your jeans are torn!” Or “I painted my house yesterday and now I have jeans that look like that too!” or the classic, “How much do people pay for those? ?” Ugh, whatever. That’s one end of the spectrum. Now take the case of artist-turned-entreprenuer Joan Claire Smith, who used to paint textured art on the sides of restaurants and other businesses, which actually resulted in people (friends, family, random people on the street) asking her WHERE she got her resulting paint-soiled jeans, wanting to get a pair for themselves. Hah! So, Smith had a lightbulb go off in her head, and in 2012 launched Dragonfly by J Claire, transferring her artwork from walls to jeans after her daughter sent a letter to the Ellen DeGeneres Show, leading to a phone call back from one of the show’s producers. Her intricately hand-painted works have already gotten a ton of Hollywood attention. According to Forest Leaves, Selena Gomez bought two pairs, and Smith had to turn down a request to create a few pairs for grab bags given to celebrities at high-profile red carpet events, due to lack of capital. Darn. Joan Claire sources her jeans from a California company, and uses stencils or goes freehand. Because of this, and her desire to stay in the designer denim market with high-end fabrics, all jeans range between $200 and $300, but Forest Leaves reports that Claire is working towards creating a lower price point, as well as a brick-and-mortar storefront which could offer customizations for customer’s existing items. She also wants to expand her denim line to fit a variety of body shapes. Joan Claire is inspired by her late father, who was also an artist and taught her early on about giving back to those in need. She keeps this mentality through her work with the company slogan of “Create, Inspire, Give Back.” Dragonfly by J Claire also offers t-shirts to help support creative arts programs in schools with the profits. She donates 5% of net profits to a wide variety of additional causes, such as anti-bullying campaigns, children’s cancer research, Pulmonary Fibrosis Foundation and various human rights campaigns! She also asks customers to suggest other causes as part of her “Urban Buzz” campaign to continuously help make the world a better place. Hopefully one of these days I can grab one of these beautiful jeans! As a denim fan, it would make sense to support this woman by adding one of her pieces to my collection. Read more about Dragonfly by J Claire or shop her designs right here. I made a blog post recently about the James Jeans Twiggy The Dancer jeans and the fact that I’ve read numerous articles over the last month or two about the denim industry supposedly suffering a little due to people preferring more comfortable loungewear-type apparel (thanks to brands like Lululemon making lounge and activewear more stylish). I still plan on making a more detailed blog post about this interesting trend, but here’s my review for these fabulous leggings from James Jeans for Denimology, as promised! As I mentioned in that post, James Jeans removed the outer seams to give the Twiggy The Dancer jeans a boost in flexibility, with a slimming effect. The base denim uses “REFORM™” which promotes impressive stretch and recovery capabilities, and the super soft fabric utilizes ISKO™ PJSOFT™ for the comfort and day-to-night wearability without feeling constricting. I actually sized down to a 25 (I’m a 26) and they looked TINY when they came in, but I have never seen any jean stretch out the way they did while still feeling like a pair of yoga pants. These jeans feature a 12oz fabric content of 50% Modal, 41.5% Cotton, 6% Polyester and 2.5% Spandex, which explains how luxurious they fit and feel! At a front rise of 8.75″ and a back rise of 13″ they fit high enough to wrap around my hips and stay put, and the inseam is at 30″ to give the super skinny legging look without the scrunch effect on the bottom that is usually cute with your traditional skinny jean. I haven’t had to wear a belt with these at all, and have worn them out on several occasions with them snapping back to their original shape each time, never bagging out. I’ve had a few moments where I’d have to pull them up but I don’t care enough to talk badly about it since it felt pretty normal for jeans so buttery soft, and it is a common thing for me to have to do that with my hips tapering off so sharply at my waist and thighs…it’s hard to find jeans that fit my shape so well without needing a belt, and these are a-OK.
Leggings always have a place in fashion, whether in the fall (tucked into boots under a dress or a tunic), or in the summer when we are just looking for soft, lightweight and comfortable alternatives to stay cool. These James Jeans Twiggy The Dancer jeans in Arabesque are extremely versatile, being a dark wash and thus going with anything, and are very easy to live in every day. Read the full review here on Denimology! Check out my other Denimology reviews here. Already convinced? Buy a pair of these jeans right here. I remember being back in London in 2006, and admiring the abundance of cute little dress boutiques. Finally at one point the girls I was with decided we’d all go shopping for one, then go hit up a Broadway play. Fortunately, I had a blast and picked a cute little 50’s housewife style number for myself…unfortunately, I ended up being too sleepy (recovering from jet lag, I guess) to join my friends on their night out. However, the dress still hangs in my closet with some occasional special moments of use, to remind me of all the fun, classy fashion that makes up my Londontown memories. Here in the states, it seems tougher to find such things (well, this is all before stores like Modcloth came to be), but there’s still something alluring and unique about UK boutiques…at least the ones I remember. Hybrid, a UK company, seems to embody that classic style I have been craving since that trip, with an extra touch. Most of their apparel is perfectly posh and clean-cut, but many are accented with lace details or asymmetrical cuts that give them all a little boost of oomph! Hybrid was born in 2010, and is now a global brand, selling in over 300 boutiques and available online through online stores such as ASOS. 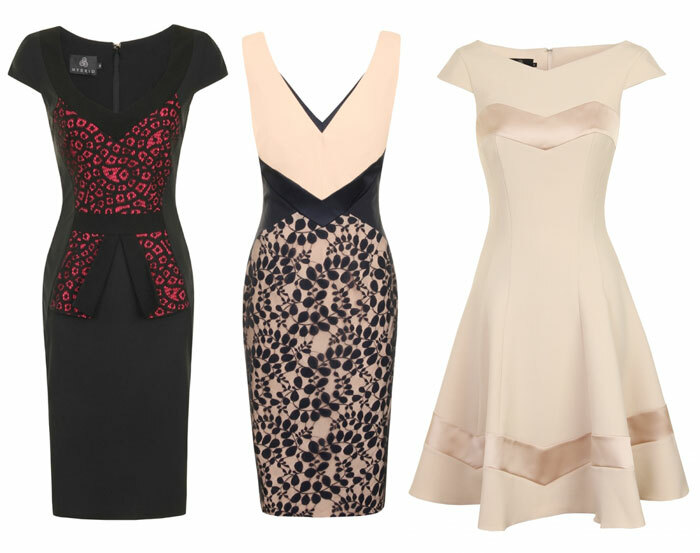 They exist in the contemporary market, but they state their “dresses not only channel a feminine aesthetic but are crafted from luxe, stretch fabrics and flatter the natural curves of the body.” Hybrid‘s entire line consists of all sorts of dresses: from bodycon to maxi dresses to skater to sweetheart…all sorted in categories such as evening, graduation, workwear, summer, graduation or even race day dresses. To me, a lot of them fit in several of these categories and truly are very versatile. I could wear most of them and upon browsing their online shop for awhile I concluded I could easily buy the whole store…must exit website, NOW. How cool are these?? They certainly reminded me that I don’t have nearly enough dresses in my closet…I love my denim, but I gotta let out my inner girly girl out sometimes. Even though I haven’t quite understood the appeal yet, vintage jeans are a huge conversation topic amongst denim fans everywhere. I never have taken the time to dig through flea markets and secondhand stores for jeans (although I have scored a few good finds on eBay), but I (like most) do understand the desire for that perfect, broken-in weekend jean. I’m just not quite sure I’d want a jean that someone else broke in…I’m more of an AG Jeans AG-Ed type of gal. However, the market and desire for vintage jeans is undeniably huge, and one duo found a smart way to tap into it, with great success. 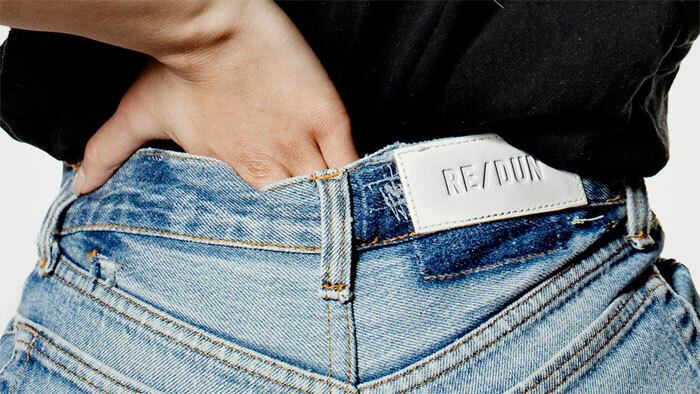 RE/DUN launched on July 28 and is the work of Sean Barron and Jamie Mazur, who are both fashion entrepreneurs and big denim fans. In an interview with Fashionista.com, Mazur states “I’ve collected vintage Levi’s my entire life, since I first discovered them in my late teens. I love the washes on them, but I never really liked the way they fit because they were just wide-legged, non-flattering and high-waisted old jeans from the ’50s and ’60s. At a certain point I discovered these special denim tailors that you could take them to, and basically they’ll fit them to your body and make them fit like modern jeans.” Inspired by the originality and unique personalities of vintage jeans, Mazur and Barron started up RE/DUN with 50 pairs of jeans they hand-picked and had tailored from the bottom up: each jean was deconstructed by the seams and resewn into either a straight skinny or relaxed straight jean, which are the two styles available on their website. Each pair is priced in the $200 range and apparently, all sold out in the first 50 hours! There are several styles currently available but many are still sold out…this is solid proof that there was a definite niche waiting to be filled, and these guys knew it. It seems there’s a pattern going on here, with most of my Denimology reviews somehow falling into the dark skinny jean category…so this time I decided to do something different. Skinnies go with everything, and are my absolute favorite since they go so well through all seasons, but when the warm sweaty weather hits sometimes it’s nice to slip into something a little more relaxed and comfortable, like a boyfriend jean! The boyfriend jean has made its round through the fashion world for the last few years, and I believe it was first made popular when Katie Holmes was seen wearing Tom Cruise’s rolled up jeans while out on the town a few times! I own a nice comfy pair that Rich & Skinny came out with shortly after when the style was still in its infancy, and now it’s pretty much a staple style that just about every denim brand has in its collection. I was introduced to Standards & Practices recently and I chose a beautiful relaxed pair to switch things up a bit here in my reviews, so here is a Standards & Practices Ex Boyfriend in Hurricane review!